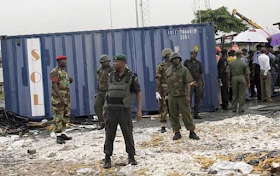 Mr. Joseph Attah, the public relations officer of the Nigeria Customs Service (NCS), said that the Service seized a container of military uniforms and other items along the Aba-Harcourt road. Attah, who said this in a statement today in Abuja, noted that the examination of the container was carried out in the presence of the owner's representative. The Federal Operations Unit (FOU) Zone C Roaming Team seized a container bearing registration number MRSU 3040288 that was wearing military uniforms and other items along the Aba-Port Harcourt Road. "The container was taken to owerri where the proper examination in the presence of the owner's representative revealed the following, 11 bullets containing new sets of sawed military camouflage. "Each bullet contains 400 pairs of sawed military camouflage, 15 cartons containing Altama combat boots, each carton contains 20 pairs and a few bags of made up clothing. "Seven wooden kitchen cabinets, 337 packs of new foreign tiles made in China, 27 medical equipment made in China, 34 rolls of water pipes made in China and some household items," said Attah. According to him, the controller in charge of the FOU, Zone C, Ahmed Azarema, said that the representative of the owner had been arrested.